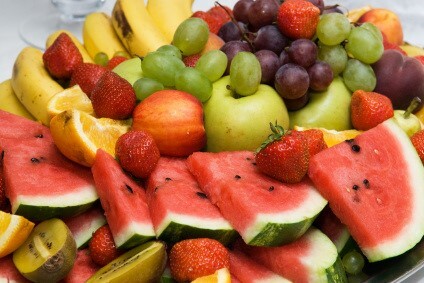 GUEST BLOG ENTRY: MOTHER NATURE’S HEART HEALTH PLAN - What About Watermelon? It’s no secret that watermelon is as healthy as it is delicious, but just how healthy is it? As healthy as a big, heaping salad? Or a kale smoothie? Today’s guest blog entry from nutritionist and dietician, Elizabeth Somer, sheds some light on all the ways watermelon may be good for your heart and more. Heart disease is the number one killer in the United States. The good news is that there are many things you can do to reduce your risk. Preventing heart disease is a three-tiered job that includes a nutritious diet, daily exercise and healthy lifestyle habits. You can slim your waistline AND protect your heart by focusing on Mother Nature’s best foods: colorful fruits and vegetables. Aim for at least two servings of colorful fruits and vegetables at every meal, and at least one at every snack, for a total of no less than eight servings a day. Colorful produce is a good source of antioxidants that protect arteries from damage associated with inflammation. Almost all produce is cholesterol and fat-free, low in sodium, and rich in vitamins, minerals, fiber and antioxidants. For example, watermelon provides vitamins A and C, potassium and heart-healthful antioxidants, such as lycopene. It also contains citrulline, a compound that aids blood flow. Watermelon provides a perfect combination of fiber and water, two compounds that help fill you up before they fill you out, so you push away from the table before you’ve overeaten. That makes watermelon a great inclusion in any weight-management plan. While cutting back on saturated fat is good for your heart, a little healthy fat, such as the monounsaturated fats in nuts, avocados and olive oil, is good for you and helps boost absorption of some of those nutrients in produce, such as the lycopene and vitamin A in watermelon. The healthy fat in avocado, combined with watermelon, chilies, cilantro and a little lime juice, makes a great salsa and topping for salmon or as a dip for veggies. Or, sprinkle pistachios over a spinach and watermelon salad (just go light on the dressing!). Yes, the foods that protect your heart are the same foods that slim your waistline. And remember: If you eat well and move daily, your heart will thank you for it!